Want to add some dividends to your portfolio in December? Check out Amgen, Gilead Sciences, American Tower, Enterprise Products Partners, and Albemarle Corporation. 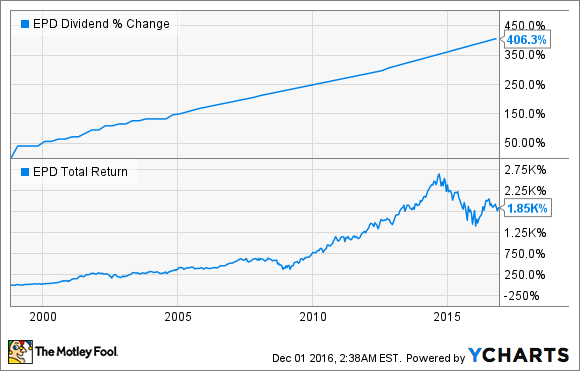 With 2017 right around the bend, investors are likely looking for some stocks to add to their portfolio. While the market has been hitting all-time highs lately and valuations are looking a bit steep, there are still some stocks out there worth buying in December. For those looking for some dividend-paying stocks, some pretty decent buys remain. So we asked several of our contributors to each highlight a dividend stock worth buying in December. They came up with five: biotech giants Amgen (NASDAQ:AMGN) and Gilead Sciences (NASDAQ:GILD), wireless tower operator American Tower (NYSE:AMT), pipeline company Enterprise Products Partners (NYSE:EPD), and specialty chemicals producer Albemarle Corporation (NYSE:ALB). Here's what they had to say. Sean Williams (Amgen): Following the beating the drug industry has taken over the past couple of months, my dividend stock suggestion for December is the original biotech blue chip: Amgen. Amgen's most recent struggles are tied to weakness from its lead drug Enbrel, an anti-inflammatory that's prescribed to treat rheumatoid arthritis and plaque psoriasis, among other conditions. Its management team essentially admitted during its third-quarter conference call that its pricing power on Enbrel has come to an end, meaning it'll struggle to grow the top line of its $5 billion-a-year drug. Wall Street was none too pleased with Enbrel's predicament, but it overlooks three important selling points for Amgen. To begin with, Amgen controls its expenditures better than most drugmakers. In 2014, the company announced that it would lay off 4,000 employees in an effort to save $1.5 billion annually. Amgen's long-term target has been operating margins of 52% to 54%, which is markedly higher than the 37.3% operating margin it delivered in 2013. Amgen has numerous levers it can pull to cut costs if it becomes necessary to retain its 52%-54% operating margins. Second, Amgen has delivered a smorgasbord of innovation over the past couple of quarters, launching around a half-dozen drugs. Multiple myeloma drug Kyprolis is extrapolating out to $732 million in annual sales based on the 34% year-over-year growth it delivered in Q3, while next-generation LDL-cholesterol-lowering drug Repatha generated $40 million in revenue in Q3. Repatha delivered LDL-C reductions of around 60% in clinical studies where existing therapies weren't enough, meaning it could be a game changer in the LDL-C reducing space. Amgen's long-term cardiovascular study on injectable Repatha should be released soon, and if it demonstrates a statistically significant benefit over the current standard of care, Repatha could achieve $2 billion in peak annual sales, if not more. In other words, innovation isn't an issue. 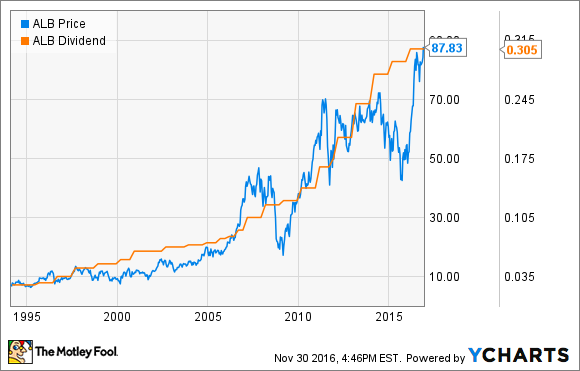 Last, Amgen has a long history of doing right by its shareholders via share buybacks and dividend hikes. Since introducing a dividend in 2011, Amgen has increased its payout by a compound annual rate of almost 30%. Currently paying out $4 annually, but on track to generate more than $13 in EPS by 2018, Amgen and its 2.7% yield look poised to grow. Tyler Crowe (Enterprise Products Partners): If you're looking for a stock with a strong reputation for growing dividends through thick and thin, then you can't overlook Enterprise Products Partners. Sure, it's in the energy industry and anything energy can be notoriously cyclical, but as a pipeline, processing, and logistics company, it doesn't have a whole lot of exposure to actual oil and gas prices. In fact, its contracts with producers and consumers guarantee that more than 85% of its revenue comes from fee-based services that guarantee minimum volume commitments. It's small things like this that set Enterprise Products Partners apart from the rest of the industry. Its management has been very adept at balancing growth with the need to remain conservative with its balance sheet and payout to investors. It has a rarefied status among pipeline companies as one of the very few with an investment-grade credit rating, which lowers the company's interest rates and allows greater access to capital if needed. Luckily, though, Enterprise doesn't wholly rely on outside capital for its growth, something that is uncommon for pipeline companies. These things all add up to make it one of the few major pipeline companies that has been able to raise its payout to shareholders every year for 18 years -- and it has generated fantastic total returns over that time frame. While its stock has suffered along with the rest of the industry, the company's business fundamentals remain very strong and should improve even more as oil prices start to rise and drilling activity comes back to the oil and gas patches across the U.S. With Enterprise's stock carrying a dividend yield of 6.1%, adding shares to your portfolio in December could set you up well for 2017 and beyond. Brian Feroldi (American Tower): Consumers around the world have become addicted to their smartphones, driving incredible growth in demand for mobile data. That growth is likely to continue, as estimates predict that millions of new devices are set to come on line in the years ahead, which is a great reason to invest in American Tower. American Tower is a real estate investment trust, or REIT, that owns more than 144,000 cellular towers spread around the world. Local wireless providers rent out space on these towers so they can provide broad coverage to their customers. Carriers are happy to do so because it is easier and less capital intensive for them to rent the space rather than own and maintain the towers themselves. What's wonderful about this business model is that American Tower is carrier-agnostic. That allows it to rent out a single tower to multiple carriers at the same time. Since it costs the company very little to add another tenant to a tower, most of the extra revenue falls to the bottom line. That has allowed the company to drive huge growth in both its free cash flow and dividend over the last few years. 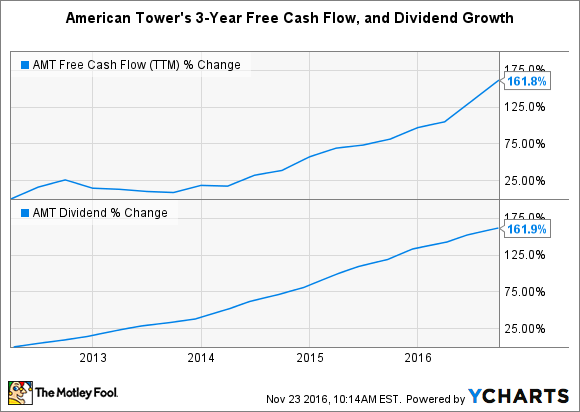 AMT free cash flow (TTM) data by YCharts. Looking ahead, management believes that tower demand should allow it to grow its dividend by at least 20% annually for the foreseeable future. That's an attractive growth rate for a company that currently yields over 2%, so this is a stock that growth and income investors alike can learn to love. George Budwell (Gilead Sciences): Although I've given Gilead a fair amount of flak for management's utter reluctance to address its growth problem via an acquisition, there's really no question that this big biotech's dividend is as about as attractive as they come. Gilead offers an industry-average yield of 2.5% at current levels. While such a pedestrian yield for a large-cap biopharma may not sound all that compelling, the stock does sport the lowest payout ratio (16.7%) among all dividend-paying biotechs. Even better, Gilead's free cash flow over the past year stands at a staggering $18 billion. And if these two impressive metrics weren't convincing enough, Gilead has also racked up over $30 billion in cash, which is one of the largest cash positions in the entire healthcare sector. This biotech's dividend is arguably one of the most sustainable among major drugmakers, and its healthy balance sheet bodes extremely well for the possibility of future increases to its payout over the next year or so. Perhaps the best part is that Gilead's monstrous cash position is so large that it should be able to execute multiple acquisitions without having to pump the brakes on its newly minted dividend program moving forward. Daniel Miller (Albemarle Corporation): I'd be willing to bet Albemarle Corporation isn't already on your dividend shopping list, and that you probably haven't even heard of it. Albemarle is a specialty chemical company providing solutions to customers in more than 100 countries across many industries. It focuses on lithium, bromine, and flame retardants, among other products. But the reason it made my shopping list is that it stands to greatly benefit if electric vehicles (EVs) slowly become mainstream, which, as things stand today, would drive strong demand for lithium. Albemarle is one of the world's largest producers of lithium, with top-tier and low-cost assets in Chile. While the company provides lithium for batteries for many products, such as cellphones and power tools, the amount of lithium content in EV batteries is absurd in comparison -- just look at the details below. Image source: Albemarle Goldman Sachs conference presentation. We're almost at the point where lithium batteries are inexpensive enough to be produced in vehicles priced for the masses, a theory that Tesla Motors will soon be testing with its Model 3, which is estimated to sell in the mid-$30,000s. The good news, if you tend to be more pessimistic about how quickly the masses will adopt EVs, is that Albemarle will pay you a consistent dividend while you wait for the lithium battery catalyst. Currently it returns $1.22 to investors annually for a yield of 1.4%, and it's posted 22 consecutive years of increases since becoming a publicly traded company in the mid-1990s. If you believe EVs are the future and that lithium batteries will continue to power those vehicles, this is absolutely a dividend stock to buy soon.